The game mode is played by two teams of 15 players , whom converge in the air battles on many maps. In this victory can be achieved as knocking all the enemy planes and achieving excellence in points, and destroy enemy ground targets . In this incredibly important and harmonious teamwork and individual contribution of each - because the World of Warplanes any pilot can change the outcome of the battle . Game time range encompasses one of the most interesting periods in the history of the aircraft . 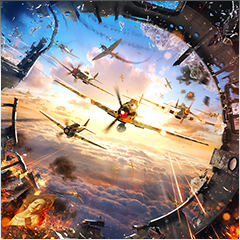 You can start your battle your way to the biplanes of the 1930s , to continue his legendary fighting vehicles of World War II and demonstrate aerobatics at the helm of the first jet fighters Korean War , became the progenitors of the modern " steel birds ".